Right now, my writing self and my research self are sharing the seventeenth century. I tend to think of Shakespeare as a sixteenth century writer, because a lot of his themes borrow from the Middle Ages (which is my main historical stomping ground) and because I associate him with Elizabeth I. The truth is, however, that he wrote well into the seventeenth century. He died in 1616. This means he was a seventeenth century writer. It also means that many aspects of his world view reflect the sixteenth century. Shakespeare is on the cusp of change. This is one of the reasons his work can be interpreted in so many ways. We tend to think of the seventeenth century as nearly modern. It’s the Time of the Rise of Reason and the Rise of Science and the Formation of Us. All this is true. At the same time, the seventeenth century had an underlying world view that was anything but modern. Shakespeare reflects this in his plays. He reminds us that we’re all formed by our pasts, even if we don’t remember those pasts or know much about them. Prospero demonstrates the older world view in The Tempest. In fact, the whole Tempest demonstrates this. It shows the relationship between humans and non-human sentient beings in a great chain of being, for instance. 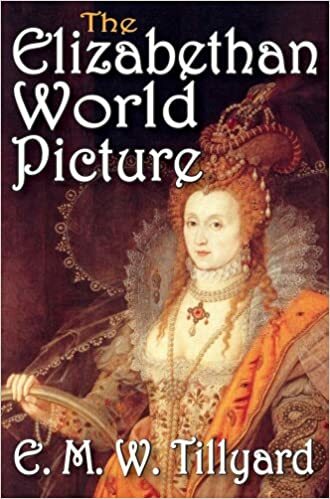 I was first introduced to the great chain of being when I was in Year Eleven (age 15-16, for those who like to keep track of these things) and read Tillyard’s The Elizabethan World Picture. I fell in love with The Tempest when I read Mary Stewart’s This Rough Magic, not too long after. I had already read everything we knew of by Shakespeare and gone to every performance I could, for I was a sad Shakespeare addict, but I never liked The Tempest. I hated what was done to Caliban and playing tricks on people for purportedly moral reasons totally bugged me. Stewart helped me realise the glory of the language and the emotional impact of Prospero’s actions and Tillyard’s description of the world view Shakespeare used to structure The Tempest suddenly clicked: it all made sense. Prior to this, Twelfth Night was my favourite. It’s also about the world order, but it’s strictly human. It played with the order of the world as I knew it. Australians from scientific families find it easier to understand humans and to understand rational thought, but take a bit longer to see the universe from alien eyes. And, in many ways, Shakespeare is quite, quite alien to our modern selves. So, first, what is it about Twelfth Night that was easier to understand? The fact that the speech was false, emotional blackmail, said by a heterosexual female in disguise was irrelevant. It called me, the way it called Olivia. These days, I wonder what the implications would be if Olivia and Viola were truly in love and the men in the story were mere distractions. We change over time. Our understanding of the world changes over time. Shakespeare is very forgiving of such changes. His plays fit many interpretations. One day I might write the story of Olivia and Viola and how they found love despite their society. When I was a teen, however, I learned the speech and ignored the context and the subtext and, in fact, everything but the text itself. And I’m not so sure that I understood the text itself. I found it beautiful, and, for an emotional teenager, that was enough. And this is why Twelfth Night is easier for moderns. We can understand it (to a degree) through the text alone. We focus on whatever facet of love or comedy that suits us, and we enjoy the play. For me, older, The Tempest is easier to delve into, emotionally. I’ve had to lose big things in my life, so Prospero is me. I’ve had to travel alone and in exile and so Prospero is again me. So, for many people (including me), The Tempest still has a modern ring. It’s accessible. It wasn’t accessible to me as a teen, but it is as an adult. Life experience changes things. And yet, when I stopped to think about it, Prospero faded. All I could think of was what a perfect epitome of the early seventeenth century world view The Tempest represents. The historian in me loves pulling it to pieces and putting it back together again, because every time I read it or see it I gain a new insight into Shakespeare’s world. Sometimes I gain substantial insights because directors and actors don’t see Shakespeare’s very structured and complex reality. They humanise things and transform The Tempest into another Twelfth Night. The difference between human and non-human is faded and uncertain or the status of various players doesn’t reflect their position in the universe. The play itself gives such clear indications about class and about status, ranging from a jug of wine to a royal human so senior hierarchically that he has powers akin to angelic. We discover that the hierarchy is not fixed. The Tempest contains a social lesson as to what is possible and what is impossible. Caliban remains a monster and Prospero discovers he cannot reach godhood and must shoulder his human responsibilities. The love story is a mere excuse for an exploration of far deeper matters. Maybe Twelfth Night is more than a diversion, too. I doubt it, though. I doubt it because of its name. The Tempest suggests that the world will turn topsy-turvy and the question is open: will people find their right places at the end. Twelfth Night, as a title, reflects the last day of Christmastide. A time of fun and for emotions and for bulwarking oneself against the long, long winter. Not the time for deep thoughts about the human condition. My deep thought at the moment is that I need a cup of coffee. Coffee reached England about forty years after Shakespeare died. I wonder what his plays would have been like if fuelled by coffee? Thanks for a very enjoyable post. My secondary school Shakespeare was Julius Caesar, Richard III and King Lear. I fell in love with the beauty of the language in King Lear when I got to Lear's speech banishing Cordelia(and frankly, even today I can't quite stop myself from muttering, "For heaven's sake, Cordelia, he's your Daddy who adores you, all he wants is a big hug!" ) By the time I left school I was a hopeless Bardaholic, as I remain. When I was at uni, I did a French language conversation class with an actor who'd performed Twelfth Night and said(in French) that there's something odd about Orsino suddenly happy to marry Viola who is still, as far as he's concerned, Cesario. That's something else to think about. As for the Olivia/Viola thing, I'm not sure it would work. Maybe Olivia would be okay with Viola, but - would Viola be in love with her? She's hopelessly in love with Orsino(whether he deserves her is another matter). You'd need a lot of work to fix that. The Bell Shakespeare Company did a rather interesting interpretation of The Tempest. The island was Australia. Both Caliban and Ariel were portrayed as indigenous Australians. When released, Caliban shows his contempt for Prospero. Ariel(played by a woman) throws off her European clothing and joins a group of indigenous women "spirits". I suppose The Tempest is an autumnal piece more suited to a mature person than the romantic comedy of Twelfth Night. I still enjoy both. What a delicious post! I love how much fodder the bard provided for future authors and have just downloaded Mary Stewart's This Rough Magic to re-read and compare with the Tempest. Sue - I love it that we studied similar things (for we were in the same education system) and got such different and very personal outcomes. Caroline - I hope you enjoy Mary Stewart. She's an incredibly good writer, one of those few who should never go out of fashion.